Hands-on learning is of prime importance for four- and five-year-olds since they learn by doing. 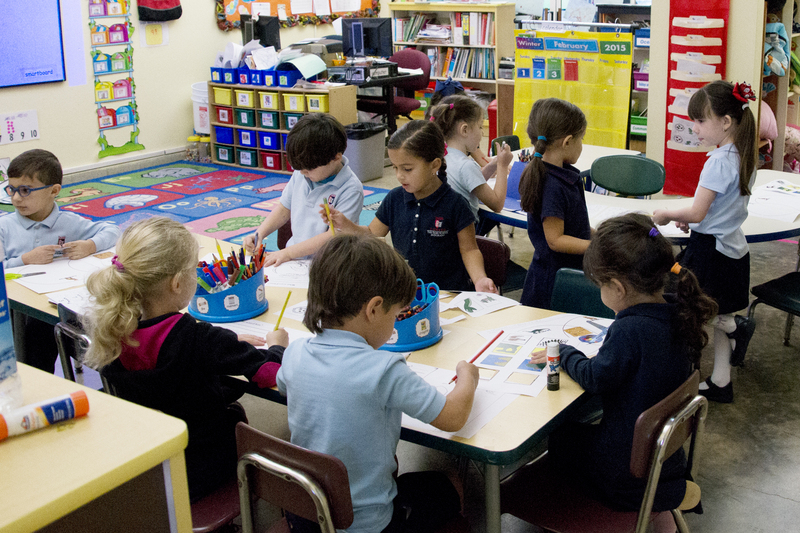 The Pre-K and Kindergarten teachers introduce material in small and whole-group lessons after which students put their learning into practice at hands-on Learning Centers. Literacy learning in English and in Spanish includes learning the letters of the alphabet and their sounds, understanding that letters represents sounds and printed words carry meaning, adding details to art to add meaning to the work, using random letters to label artwork and then progressing to invented spelling and sounding out words to write. As children discover the joys of reading and writing they develop reading fluency and learn reading comprehension strategies. By the end of Kindergarten students are able to read age-appropriate stories and write at least two complete, related sentences. Children discover mathematical relationships through counting, skip counting, pattern identification, problem solving, daily calendar work, and comparing and graphing. Students progress gradually from concrete figuring to mental computation and more abstract concepts. Social Studies and Science lessons and activities incorporate language and math learning and introduce cultural and scientific topics such as the world of dinosaurs and facts about Puerto Rico. Physical Education is an important part of the weekly schedule, and all students participate in a trimester each of Art, Music and Drama with teachers who are experts in their fields. We take advantage of our unique geographical setting to study outside when appropriate, and we bring in guests and take the children on field trips to complement the curriculum. Core values are integrated into all of our programs.